Safety has been one of the biggest concerns in the Indian Railways system. 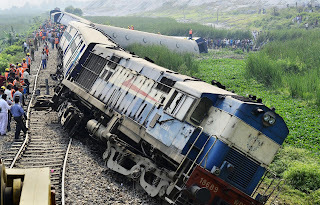 Railway accidents happen due to several reasons. An incorrect signal, a mistake or an act of negligence by one of its staff directly associated with the running of trains, deficiency in tracks, a rash act by one of the millions of road users, an irresponsible act by a passenger who carries inflammable goods. Majority of the accidents were caused due to derailments. Recently At least thirteen coaches of the Vasco Da Gama-Patna express derailed at Manikpur railway station in Chitrakoot, Uttar Pradesh on Friday (24 November, 2017) morning. Many people injured in this accident. Safety Action Plans were continually executed to reduce accidents. Periodical safety audits of different Divisions by multidisciplinary teams of Zonal Railways as well as inter-railway safety audits were conducted on regular basis. A multi-pronged approach with focus on introduction of newer technologies, mechanization of maintenance, early detection of flaws, etc. to reduce human dependence in the first place, along with upgrading the skills of the human resources were the prime drivers for accident prevention.